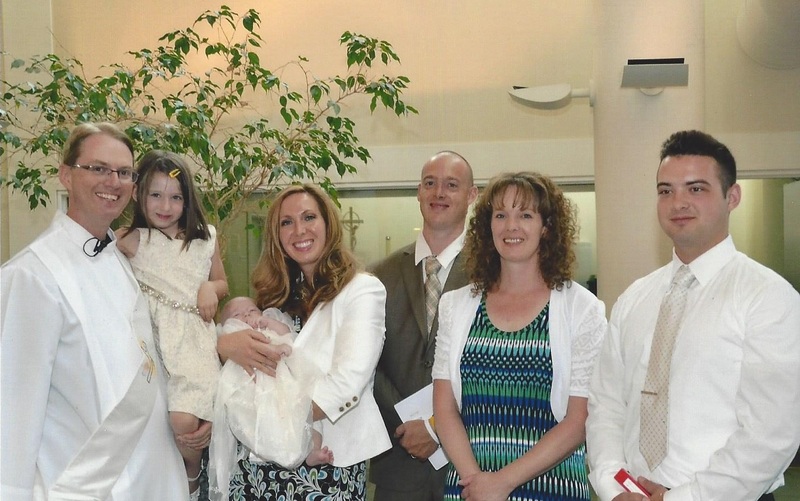 Though Baptism is generally administered to infants of Catholic parents, we also baptize adults. This is done through the Rite of Christian Initiation of Adults (RCIA). Contact Charlie Hunt to learn more about Adult Faith Formation (440-946-3287). On the first Wednesdays of September, December, March and June, a pre-Baptism class is held for parents whose first child is to be baptized. This class is required. Time: 7:00-9:00 pm. Ceremony is arranged with the pastor. The Celebration of the Eucharist (Mass) is at the heart of Catholic faith. It truly expresses who we are in our relationship with God while forming us into a people destined for glory. We gather each Sunday as a parish family to celebrate Mass. Sunday Mass is the foundation of parish life and weekly attendance is necessary to a healthy and vital relationship with God for the Catholic Christian. Weekend Masses are celebrated every Saturday at 5:00 p.m. and every Sunday at 7:30, 9:30, and 11:30 a.m. Sunday 5:00 p.m. Mass is celebrated from November to Easter. Daily Masses are offered at 7:00 p.m. Monday and Thursday and at 8:30 a.m. Tuesday, Wednesday and Friday. Holy Day Mass schedules are published in the bulletin and on the parish website. The Sacrament of Penance is a celebration of God’s forgiveness of sins committed after Baptism. Those who are in serious sin are required to receive the sacrament within a year. Beyond that, the sacrament has been a wonderful source of grace for Catholic people who use the sacrament devotionally. In this case, people may choose to receive the sacrament monthly, semi-annually or whenever. We have regularly scheduled opportunities for individual reconciliation every Saturday from 3:30 p.m. to 4:30 p.m. Parishioners can also contact Fr. Kevin to schedule an appointment. Hours are extended to celebrate this sacrament prior to Christmas and Easter. Please look for updates under Mass and Confessions Times and in the bulletin. The Sacrament of Confirmation is integrally tied to the Sacrament of Baptism. 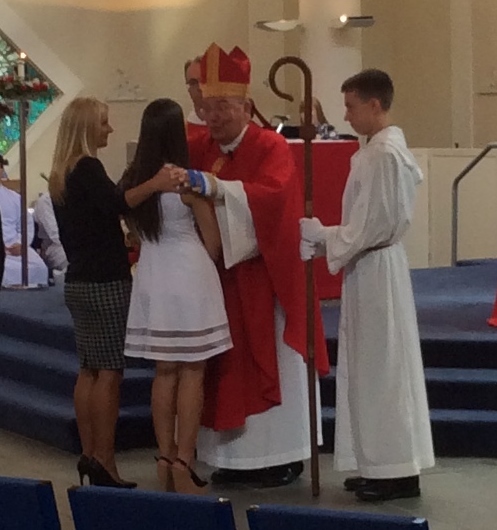 Adults who are baptized receive the Sacrament of Confirmation at the same time. In the case of infants and young children, the Sacrament of Confirmation is given at a later time (sometime after they have attained the “age of reason”) and can freely choose to receive it. This sacrament completes Baptism because it calls one to a fuller living of the Christian life and in the power of the Holy Spirit, equips them for service. 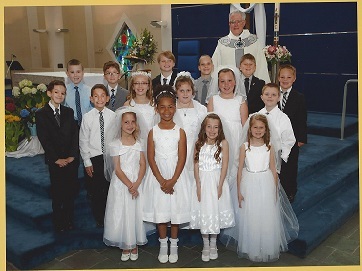 Young parishioners (typically high-school sophomores) who are baptized and interested in further exploring the gifts of the Holy Spirit are encouraged to receive the Sacrament of Confirmation. The Church is a healing community in the spirit of Christ, who is our head. This sacrament, administered by the priest, was considered a sacrament of the dying, and referred to as “Extreme Unction” or “Last Rites.” However, it is now considered as a sacrament of the living, and is administered not only at the time of near death, but also to the seriously ill (physically or mentally), those facing serious surgery, those in chronic pain, and the elderly. Anyone may request to receive the sacrament for the above reasons by calling the Parish Office, 440-946-1177. Call the Parish Office immediately if you need to schedule a funeral. Funeral arrangements are made in consultation with the funeral home and family. St. Justin Martyr has an active Funeral Ministry that assists the pastor in making the family more welcomed by our parish at a time of grieving. We assist at various parts of the Liturgy, as Extra-Ordinary Ministers of the Eucharist and greeters. Families are also given the option of having a booklet created for their loved one’s Mass. We welcome help with typing, hosts, adult servers and people to send cards. Please contact Beth Rossetti to become involved, 440-946-1177 or beth@stjustin.net.